Like Tom Selleck’s character, Matthew Quigley, from one of my favorite movies, Quigley Down Under, I’ve never had much use for pistols. That changed when I heard about the pack of wolves that attacked a grouse hunter and his Brittany in an area that I enjoy hunting in northern Minnesota. That’s when I started to think about carrying a sidearm. Since then, a sidearm has become a regular part of my equipment, even though I know the odds are overwhelming against ever needing to use it for self-defense. The following is an overview and use cases for my three favorite sidearms for backcountry hunting. The Ruger line of Mark .22 pistols have been around since 1950. I have owned both a Mark I, III and now a IV. Having owned several editions, in my opinion, the Mark IV is the new high water mark for the gun in terms of build quality and engineering. The previous editions were great guns except for the fact that it took an engineering degree and a hammer to take one apart to clean it. The Mark IV elegantly solves this problem. You can take your Mark IV apart with just the push of a button. The Mark IV comes in a variety of configurations. My favorite is the Hunter model that sports a longer 6.88″ fluted bull barrel, stainless construction, fiber optic sites and fancy hardwood grips. 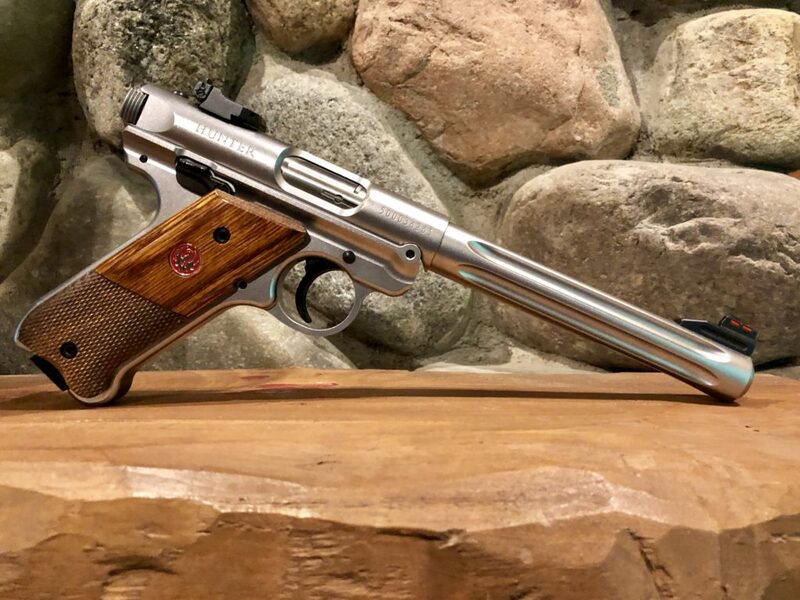 It’s not going to dissuade a bear so not a good option in bear country, but beyond that, the .22 Mark IV is about the handiest pistol you can own. Mine has seen use as a camping gun, I’ve carried it grouse hunting and it’s been handy for any time I feel like going for a hike and don’t want to carry my .22 rifle. Beyond that, it’s more fun and less expensive to shoot than any gun I own so it sees more than its share of range time. For the Ruger Mark IV, I like the HIVIZ Holster #754 by Triple K that accommodates the Hunter Model’s fiber optic sights, with matching belt. Available from America’s Gun Store. Triple K also makes a nice shoulder rig for Mark IV’s that wear a scope. The Sig Sauer P938’s origins can be traced back to the Colt Model 1908 designed by who else, John M Browning. Sig Sauer’s version started with their P238 (.380ACP) and then the 9MM version the P938. The P938 is an alloy-frame, stainless slide, single-action pistol chambered in 9mm. The P938 sports Sig’s night sights in a standard three-dot combat sight setup that many shooters prefer. 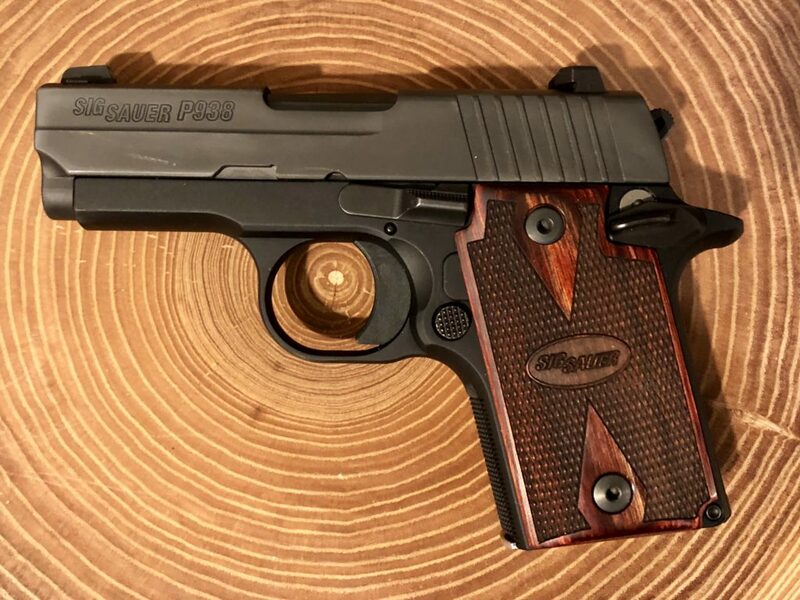 The Sig comes in a variety of options from a plain-Jane stripped down version to fancier editions and there is a healthy aftermarket for grips and other accessories. If you like 1911’s this is your gun, as it looks and operates like a scaled down 1911. It’s a small frame “pocket pistol”, but despite the small size and 3″ barrel, I can create semi-respectable groups within 20 yards with my P938. My Sig P938 does double duty as my concealed carry gun and as my sidearm on my Colorado elk hunts. In Colorado, there are no grizzlies to worry about, but there are mountain lions and black bears. I often hunt by myself, so whether for self-defense or signaling for help, I really don’t notice the 16 oz weight of the Sig and it’s a nice piece of mind on my belt. 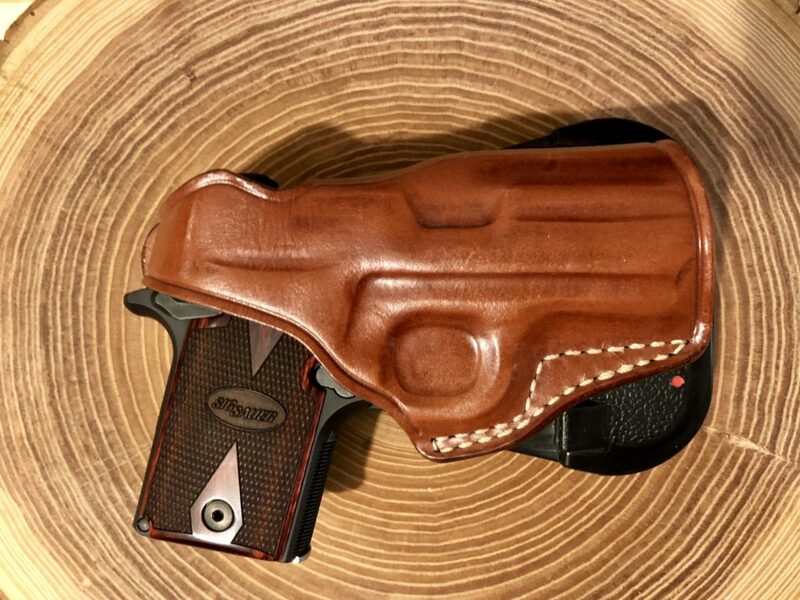 For use as a hunting carry pistol, I like either a quality leather belt holster or an OWB paddle Holster like the one featured above from Masc Holsters. 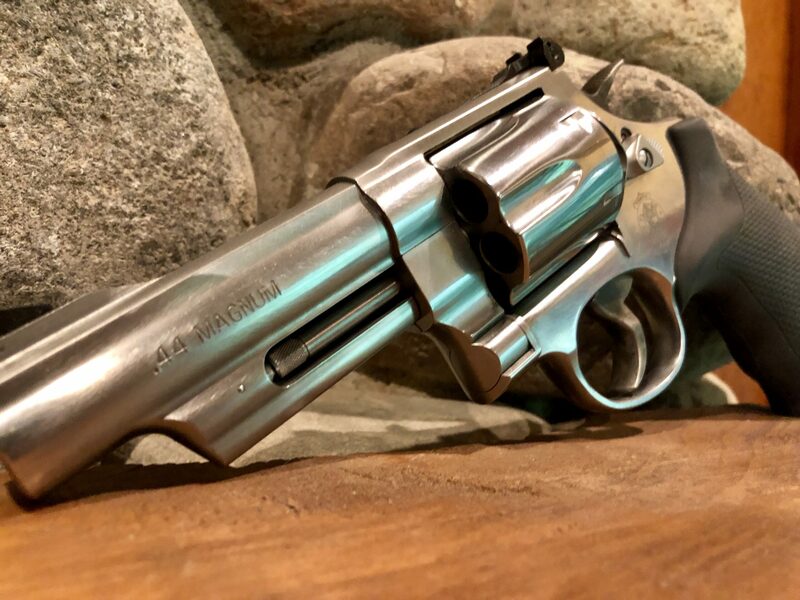 The 629 is chambered in .44 Magnum, the caliber the Clint Eastwood made famous as the most powerful handgun in the world. Today multiple rounds such as the 454 Casull or S&W500 have eclipsed the .44 Mag in power, but it still remains a formidable cartridge. 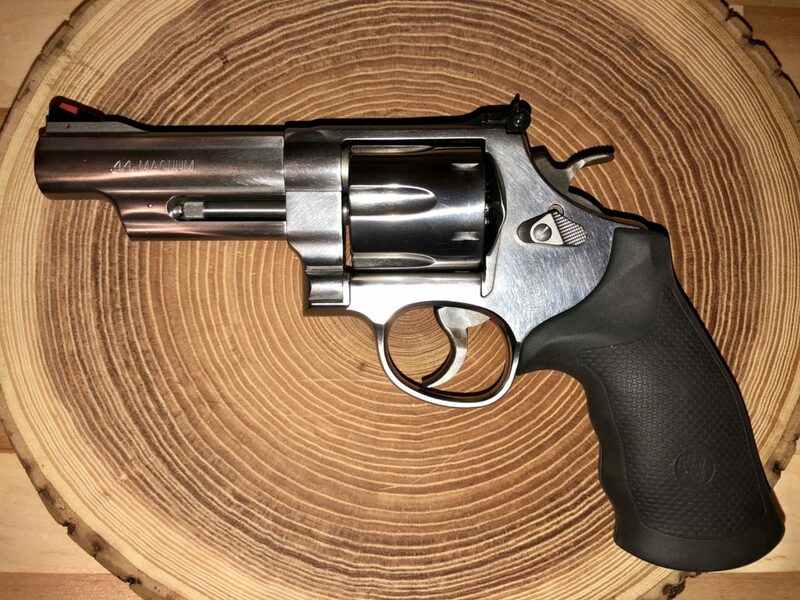 The Smith and Wesson 629 is a classic double action revolver design of exceeding quality. My only dislike is the little safety key on the frame that allows the gun to be locked. In reality, no one ever uses this feature, it doesn’t make the world safer and it does introduce more unnecessary moving parts and another entry point for dirt and moisture. Do a Google search for Bear Defense Gun and you’ll get million’s of results. People who have never seen or been remotely close to a grizzly bear are apparently very concerned about being eaten by one. If you want to create a passionate online debate just write a blog post espousing the virtues of the 9MM as a bear defense gun. My 629 has two core uses: 1.) I enjoy shooting and owning firearms and the 629 is a quality firearm that is an absolute hoot to shoot. 2.) Archery elk hunting is quickly becoming my obsession and favorite form of hunting. To date, my elk hunting has been limited to Colorado (no grizzly bears), but I am planning hunts in Wyoming and Montana in the heart of grizzly country in the near future. I know I’ll sleep more soundly in my one-man tent with my 629 close at hand. 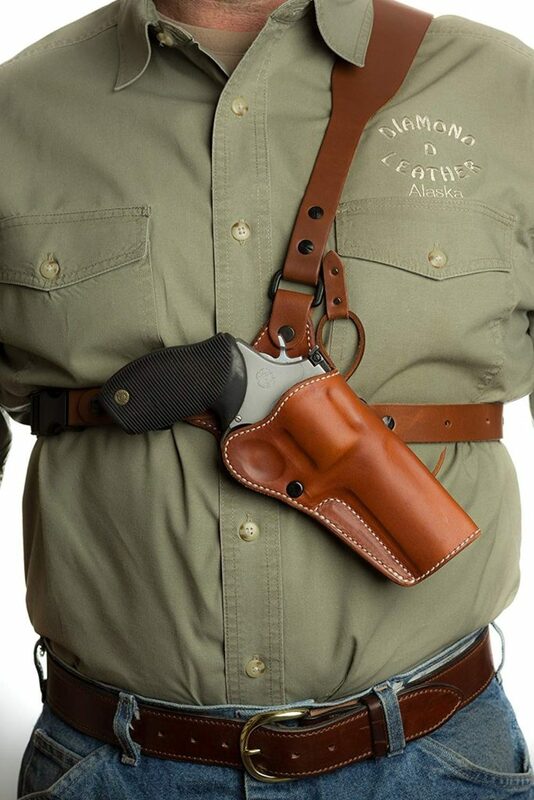 For a heavy bear country gun, like the 629 (my 629 with the 4″ barrel weighs 41.5 oz) you want a good chest holster to provide both fast access if you need it and to have your shoulders carry the weight. 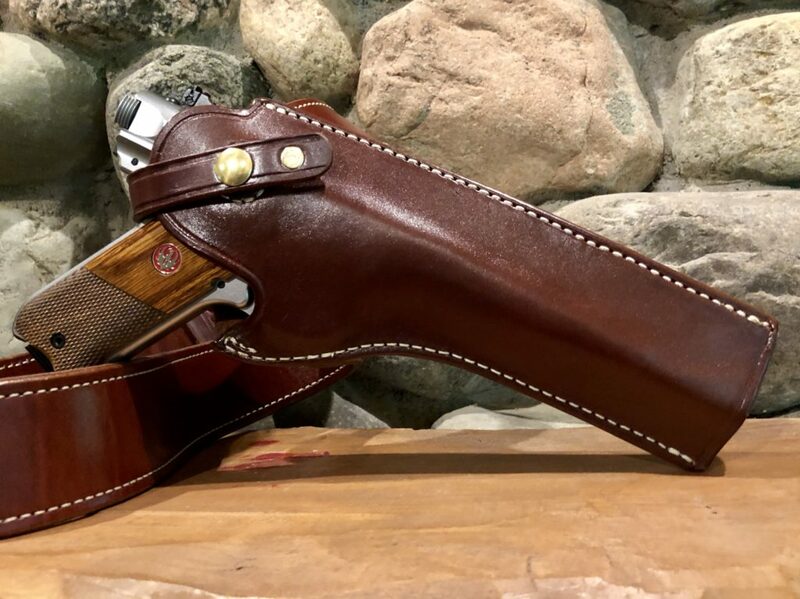 You’d be hard pressed to find a better one than the Guides Choice Chest Holster from Diamond D. This is a high-quality leather holster made in Alaska, by people who are regularly in the grizzly woods. It’s available for all popular bear defense handguns. In my testing, I found it comfortable to wear, and I could adjust it to the side to still be able to use my Alaska Guide Creations bino harness. 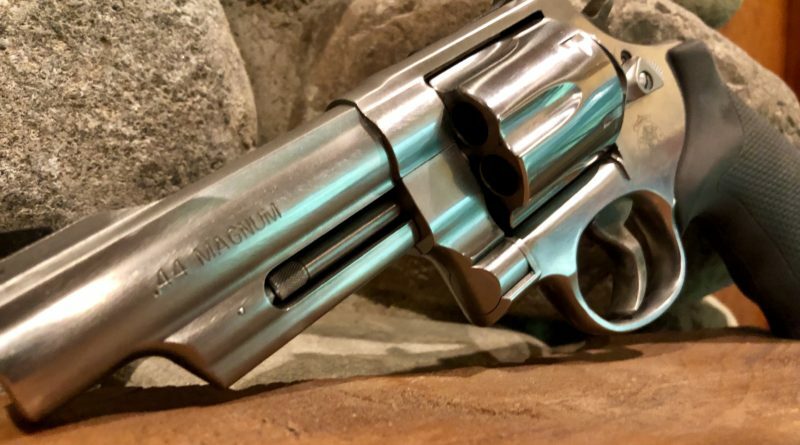 When it comes to sidearms for backcountry hunting, you have a lot of options and considerations, hopefully, this article has sparked some ideas and given you a few ideas to consider for your next handgun or backcountry sidearm.